This is a wonderful way to enhance your home, aura or working environment with vibrational essences that calm body & mind without causing lethargy or any negative impact on your productivity. This unique synergized formula has over 19 flower and crystal elixirs, plus 3 combination formulas of 12 + essences in each, essential oils that bring you to the herbal fields of the south of France. Equally effective for humans, animals and plants. Our best seller in South Africa. 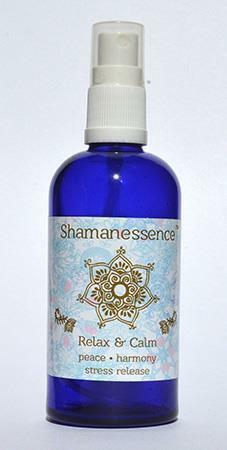 You can use this spray on your skin, as it has calming and healing effects, but not recommended for open wounds. Active Ingredients: Gotu Kola, Rosa Foetia, Dampiera, Mariposa Lilly, Heather, Beech, Mustard, Vervain, White Chestnut, Koienig Van Daenmark, Rosa Damacenta Versicolor, Combo#11Stability & Clarity(Opal(Light), Pearl (Light), Tiger's Eye) Combo#30 Emotional Stability(Garnet-Rhodolite, Ruby Star, star Sapphire) Combo#114 Addictive Patterns(Rosa Damascena Bifera, Tahitian Orchid Combo, Penny Royal, Skullcap, Morning Glory, Bo Tree, Woodwardite, Ferberite, Argon, Fomalhaut, Mirfak, Petra) Boleite, Pink Sapphire, Malachite, Magnetite Neg/Pos, Hermiker Diamond, White River Dolphins, Lapiz Lazuli. Shake well to activate the vibrational healing frequencies. Spray high over your head, around your body/environment/space. You can use this formula to treat skin as a toner/moisturizer/light cleanser. Great for room spray before important meetings, travel spray, challenging environments, or being around your favorite small fry petty tyrant..(perhaps spray discretely)!